"And the King shall answer and say unto them, Verily I say unto you, Inasmuch as ye have done it unto one of the least of these my brethren, ye have done it unto me". Sometimes we will not know this side of heaven what impact our words or actions will have for eternity. Even the smallest things may have long term consequences. How many church members are active in church today because as children someone, maybe a Sunday School teacher, pastor or a neighbor ,noticed them and encouraged their faith. Here is a true and heartwarming story. A young boy living in South Western Tanzania, a member of the Sukuma tribe, was raised with traditional beliefs which included worshipping their deceased ancestors. One day a man transferred into their village with his work. He performed his normal daily activities but he also volunteered one hour each Friday in the public school to share his faith and beliefs to the fifth grade class students. Schools had a one hour class each week for students to have religious instruction. They had Muslim, Catholic and Protestant teachers and the students could go to whatever group they chose. The man teaching the Protestant group noticed that one student took a special interest in what he was hearing so he invited him to church to attend confirmation classes he was also teaching. The family did not approve, but he came to church and was eventually baptized and confirmed. When the time came for this man to move away from the village he announced in church that he wanted to give a farewell gift to the church. That gift would be that he would pay for one person to go to Bible College and this young man would be the recipient of this generous gift. This education would have never been a possibly without this support. After successfully completing Bible College this young student went on to Seminary and was ordained a Lutheran pastor. He pastored a number of places in Sukuma land. 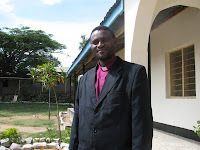 In 2009 at the age of 45, this young pastor was consecrated as Bishop of the East of Lake Victoria Diocese of the Lutheran Church of Tanzania. This diocese is one of the fastest growing Lutheran districts in the world. Bishop Andrew Gulle shared this story of his life with us and said that he invited this man to his consecration ceremony and reported that the man cried with happiness at the event. Sometimes God allows us to see the fruits of our labor to encourage us. And even better ending to this true story is that Bishop Gulle reports that his family are now baptized believers. The partnership of the Mid-South District and the East of Lake Victoria Diocese (ELVD) may not seem like much by the worlds standard but it is the only pure mission outreach help the diocese receives. The number one request from the ELVD is for help to train new pastors and evangelist to spread the word to the people in the district who have not heard the gospel message. One components of Fan into Flame is funding to support Church planting ministry training help for the ELVD. Many people feel they do not fell called to go on an actual mission trip to Tanzania but we can use our gifts and talents to support this ministry thru Fan into Flame. Our part is to be willing to offer them.